Longer-term technical indicators on equities continue to look very strong. Overall market sentiment is reaching potentially worrisome levels, which, coupled with the historically weak month of February, could usher in volatility and, eventually, a potential buying opportunity. With the historically weak month of February upon us, we take a closer look at market technicals and sentiment this week. Although equities are near all-time highs, longer-term technicals continue to look very strong. We will show how market breadth continues to suggest the path of least resistance for stocks is higher. Broad market sentiment is showing some signs of excessive optimism, which could act as a near-term contrarian warning sign. These are only near-term concerns though, as we still aren’t seeing the type of over-the-top sentiment seen at major market peaks. February may be the shortest month of the year, but it also tends to be a month of stock market corrections — especially during a post-election year. Since 1950, the month of February is one of the weakest months of the year for the S&P 500, gaining just 0.03% on average and rising only 55% of the time. Looking only at post-election years, the S&P 500 loses 1.8% on average in February, making it the weakest month of the year [Figure 1]. Considering how historically slow equity markets have been so far this year, the odds favor some big swings during the potentially volatile month of February. The S&P 500 hasn’t moved in a 1% daily range for an incredible 35 consecutive days, breaking the all-time record from 1995. Also, in January 2017, the S&P 500 traded in a range of only 1.8% (based on closing prices), the smallest range for the month of January ever. If following stock market volatility has taught us anything over the years, it is that things don’t stay too calm or too rocky for long. All of this suggests February 2017 could see some volatility, although this would be perfectly normal at this stage of a market cycle. Here’s one more way to look at post-election years. Many were looking for a post-inauguration sell-off, but we noted at the time that the play tends to be a rally after inauguration, followed by a short-term peak in early February [Figure 2]. So far the post- inauguration rally has played out, but will we get the usual February buying opportunity? Taking one last look at January, what happened was both rare and potentially very bullish. The S&P 500 was positive year to date each day of the month and did not close down more than 1% on any individual day. Since 1950, that has happened only six other times; the results the next 11 months have been very strong, with the S&P 500 rising the rest of the year all six times with a median return of more than 10%. We do expect more volatility, but the data suggest that equity weakness should be considered as a potential buying opportunity. A significant breakout just took place and hardly anyone noticed. Although new highs in the S&P 500 or “Dow 20,000” get all the headlines, a more significant breakout took place recently that puts the global bull market on very firm footing. The NYSE Composite Index (NYA), a stock market index with over 2,000 common stocks, made new highs last month. What makes this index different than others is its strong international flavor — 55 of the 100 largest market capitalization companies included in the NYA are foreign. While the S&P 500 broke out to new highs in the summer of 2016, it took the NYSE Composite until last month (January 2017) to break above its May 2015 peak [Figure 3]. This breakout of such a broadly diversified index is a very bullish sign longer term. WHAT DOES STRONG BREADTH MEAN FOR EQUITIES? The NYSE Composite was the last of the big six U.S. equity indices to reach all-time highs and when all six of these indices trend in the same direction market breadth for U.S. stocks is strong. The big six are the Standard & Poor’s 500 Index, Nasdaq Composite, Dow Jones Industrial and Transportation averages, Russell 2000 Index, and the NYSE Composite. One way to quantify trend direction is to assess where the index price is compared to its longer-term moving average; if the price is above its longer-term moving average, it is likely in a bullish trend. In technical analysis, when an index price is sustained above its 40-week simple moving average, it increases the likelihood of a long-term bullish trend [Figure 4]. Looking at historical weekly data going back 30 years, when the big six U.S. equity indices were all above their 40-week moving average, subsequent S&P 500 returns tended to be positive. Going back to 1987, this occurred 17 times. Six months later, the returns were positive 15 times (88%) with an average total return of 6.8% (and a median of 5.3%). After nine months, the returns were positive 15 times with an average total return of 10.1% (and a median of 9.3%). Looking out over the longer term, over 12 months, the returns were again positive 15 times, with an average return of 12.5% (and a median of 13.0%). For all cases analyzed, the two periods where this strategy did not perform well after signaling strong market breadth was just prior to the 1987 U.S. stock market crash and the 2000 information technology bubble burst; two events in which the U.S. equity trend reversed quickly. This historical data also suggest that there is likely to be persistence once this type of moving average crossover takes place across the big six indices. On average, the duration in between when all six indices were above their 40-week moving average to when all six indices fell below their 40-week moving average was 68 weeks, or nearly 16 months. Even though this signal was triggered last April (2016), the persistence of the market breadth suggests that U.S. equities are likely to continue trending higher in 2017. History has shown that the crowd can be right during trends, but tend to be wrong at extremes. Sentiment can be used as a contrarian indicator, because if everyone who might become bearish has already sold, only buyers are left. Of course the reverse also applies. Sentiment polls, one way to gauge investor sentiment, are flashing potential warnings signs. The latest Investors Intelligence U.S. Advisors’ Sentiment Report showed the number of newsletter writers classified as bulls has soared to 61.8%, the highest level since June 2014. The 60% level has been worrisome in the past and suggests a little too much optimism over equities here. Furthermore, according to the Conference Board, the number of U.S. consumers expecting stocks to outperform bonds is at its highest level in 11 years and consumer confidence was recently at a 15-year high. In addition, a popular survey of global fund managers found the number of investors who have taken out protection against a potential equity decline is the lowest it has been since June 2014. In other words, confidence is high and worry about any coming trouble is low — suggesting a contrarian warning is in the air. Another sign of overconfidence, the CBOE Volatility Index (VIX) often referred to as the “fear gauge,” traded below 10 last week for the first time in a decade. That is a historically low level, and the odds strongly favor that it doesn’t stay this low for long. According to data from the Investment Company Institute (ICI), domestic equity mutual funds have seen inflows four consecutive weeks for the first time in nearly two years. Of course, the $15 billion inflows this year is a drop in the hat compared to the $457 billion outflows the previous three years; nonetheless, cash moving into equity mutual funds at new highs could be a contrarian warning. Looking at what the insiders are doing is another way to look at sentiment. According to Thomson Reuters, the number of insider sales versus buys in late January spiked to the highest level in over a year. Do they know something, or are they simply taking profits after the latest rally? We would rate the current sentiment backdrop as overly optimistic, which could support some type of market correction. But is this the type of sentiment we’ve seen at previous peaks? We would answer that with a resounding no. Investors might say they are bullish now, but all it takes is a modest pullback and fear quickly grips investors. That is healthy and as long as we continue to see that, it suggests stock market dips are likely to be bought. Investor complacency in a sell-off would be more worrisome. We’ll monitor this situation on any weakness. As we laid out in our Outlook 2017: Gauging Market Milestones* publication, we expected the equity bull market to make it to eight years, but the chance of higher volatility at some point later this year remains very high. Although investors’ optimism following the latest rally could be a near-term warning, all it takes is a little market weakness and fear may quickly return. But given broad technical strength, we would expect any near-term market declines to potentially be shallow and short lived, and would likely view them as buying opportunities. *We expect mid-single-digit returns for the S&P 500 in 2017 consistent with historical mid-to-late economic cycle performance. We expect S&P 500 gains to be driven by: 1) a pickup in U.S. economic growth partially due to fiscal stimulus; 2) mid- to high-single-digit earnings gains as corporate America emerges from its year-long earnings recession; 3) an expansion in bank lending; and 4) a stable price-to-earnings ratio (PE) of 18 – 19. INDEX DESCRIPTIONS The Standard & Poor’s 500 Index is a capitalization-weighted index of 500 stocks designed to measure performance of the broad domestic economy through changes in the aggregate market value of 500 stocks representing all major industries. 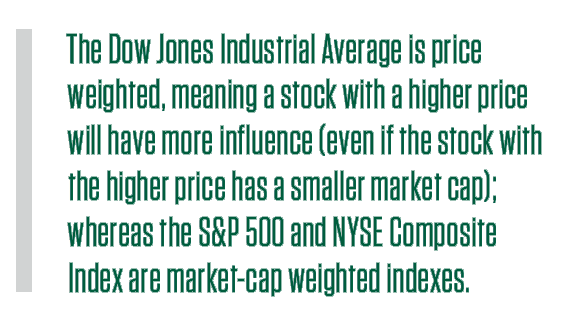 Dow Jones Industrial Average is the most widely used indicator of the overall condition of the stock market, a price-weighted average of 30 actively traded blue chip stocks, primarily industrials. The 30 stocks are chosen by the editors of the Wall Street Journal. The Dow is computed using a price-weighted indexing system, rather than the more common market cap-weighted indexing system. The NYSE Composite (NYA) is a stock market index covering all common stock listed on the New York Stock Exchange, including American depositary receipts, real estate investment trusts, tracking stocks, and foreign listings. The VIX is a measure of the volatility implied in the prices of options contracts for the S&P 500. It is a market-based estimate of future volatility. When sentiment reaches one extreme or the other, the market typically reverses course. While this is not necessarily predictive it does measure the current degree of fear present in the stock market.